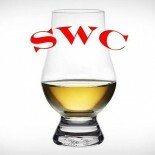 Yes, I get it, blended whiskies are not inferior to their single malt counterparts. Looking back across time immemorial, I don’t think I ever jumped on that train. Johnnie Walker Black was one of the first whiskies I became acquainted with and I certainly enjoyed it then. Many blended whiskies later, my appreciation of the category has not abated. Upon learning about the usual production methods employed in blended whisky, however, you can’t say the naysayers don’t have some sort of argument. Blending in a flavorful single malt with neutral grain spirit doesn’t exactly rock my socks off compared to the provenance of the single malt compositions. I think it’s done to simply lower production costs and offer a competitive price for the consumer. And that is why blends command 90% of the market share. Nose- Perfumed botanicals with banana. Ripe pear, barley and citrus. Nice sweetness with vanilla. Taste– Pear, spice and citrus rind. Peppery and sweet. Creamy mouthfeel. Finish- Sweet crab apple and pine needles. Tart citrus. Nutmeg and oak tannins. Comment- Won me over with time. Nice subtleties, pleasant drink. A quiet complexity with fantastic value for the money. Agree? Disagree? Come at me.